Rome, Italy is the seat of history and romance, and travelers all over the world believe that everyone should see Rome at least once. However, this may not be possible for people who have small vacation budgets, or is it? There are myriad ways to visit and enjoy Rome on a budget. The first step is to visit Hipmunk to find all the secrets for an affordable trip to Rome. Since Rome is such a popular vacation destination for people from all over the world, it seems to be crowded most of the time, but the high season is from June to September. The low season, when the hotel rates are reduced, is from November through March, except for the two weeks before and after Christmas and a few days before and after Easter, especially for Italians. Winter weather in Rome is mild, but there is some rain. January has the fewest visitors because it can get below freezing. However, the hotels are the cheapest in January, and there are still plenty of things to do and see. The lines are significantly shorter to all the major attractions. The most pleasant weather is between March and May. 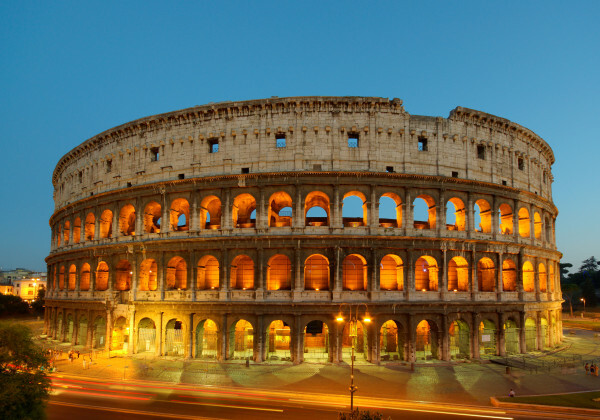 The best way to get lower hotel rates in Rome is to book well in advance. Most of the main attractions have an admission fee. Some of the most important historical sites such as the Roman Colosseum, the Palatine Hill and the Roman Forum are combined on one ticket, so if the line is long in one place, you can get the same thing at another place. The Colosseum is the main spectacle, but for history aficionados, the Forum is awesome because the greats from Roman history who ruled the known world actually walked on those stone steps and walkways and stood under the arches wielding immense power. Visiting the famous Trevi Fountain is free, but it is usually crowded with people and it is recommended to find a seat and watch the people along with the fountain. The Pantheon is nearby and has no admission fee. It was built in 27 B.C. A few other points of interest that are free to visit are St. Peter’s Basilica in the Vatican, the Villa Borghese gardens and the Crypt of Cappuchin Friars. On the last Sunday of the month visitors can go into the Vatican Museum and see the Sistine Chapel for free. Along with history and romance, Rome is famous for good food, but restaurants in the touristy areas charge high prices. The cheapest and most delicious food is pizza and pasta. There are also bakeries near Campo de’Fiori where you can get fresh baked goods, pizza and pasta dishes for reasonable prices. Gelato is on every corner and hard to pass up, but it is recommended to stay away from the ones that look fluffy and brightly colored as they may not be true Italian gelato. If you’re there on August 15th, you’ll see dancers in every piazza giving free performances for the Feast of the Assumption. In September, there is a White Night when museums stay open all night with no admission fee. If you’ve always wanted to visit Rome, but never thought you could afford it, you may be surprised to know that you can find cheap hotels and free activities in the Eternal City. And watch out for pickpocketing thieves, travelers! They’re everywhere in Italy. I loved reading this! I would love to go to Rome one day. Thanks for a great post. I would love to see Rome one day. It sounds so romantic. That, and I love Gelato. I’d probably come home ten pounds heavier than when I left. But first I need a cloak and elf ears… I don’t know why I just do. I’ve always wanted to travel to Italy. These are great tips to reference if I ever get to go. Thanks! These are great tips! I’ll be pinning this for future use! I am excited because me and my mom are planning on going to italy in the next two years. I will definitely visit rome!